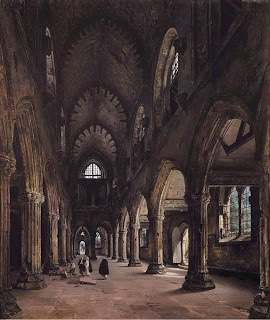 This scene depicts a gothic cathedral with a high vaulted ceiling, tall columns ending in arches and arched windows cast long rays of daylight, illuminating the lower part of the cathedral space. Several diminutive figures give a sense of scale, emphasizing the vastness of the interior. They are located in the lower right quarter of the image, and lead the viewers eye back and up, emphasizing the height and depth of the interior space. Daguerre is most famous as the inventor of the daguerrotype, the first photographic system, but even before this, he was well-known as the producer of Dioramas, a form of popular entertainment in the early 19th century that was closer to cinema than photography. THe Diorama was an enormous painting displayed in a specially designed darkened theatrical space in which cleverly positioned lights shone through the "windows" in the image, casting shifting lights and giving audiences the illusion of "being there".